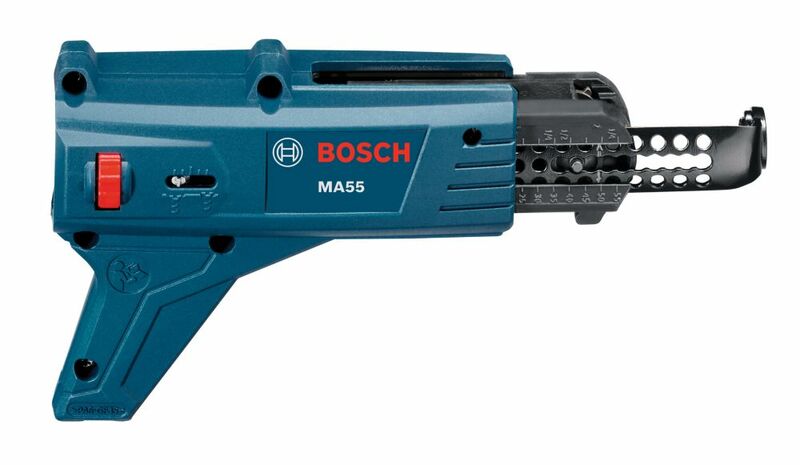 The MA55 Screw Gun auto-feed attachment for Bosch SGH182, SG450 and SG250 drywall screwdrivers delivers added efficiency. It enables precise driving of rows of screws at top speed, while allowing comfortable continuous work, due to its ergonomic design and light weight. Its open design prevents dust from getting trapped in the mechanism and allows for a long product life. The MA55 can be used with widely-distributed strips of screws that have lengths of between 1 In. and 2-1/8 In. (25 mm and 55 mm), screw shank diameters up to 0.2 In. (5 mm), and screw head diameters up to 3/8 In. (9.5 mm). Carbide tipped for long life in tough applications. Centric tip ensures quick starts in concrete. Wear mark alerts user when tip wears beyond ANSI specification. Bit runs cooler thanks to improved flute design. Bosch carbide rotary hammer bits feature tips that stay sharper longer and deliver more holes within specification than competitive bits. Manufactured to ANSI specification B212.14. SDS-max rotary hammer bits fit Bosch SDS-max hammers and competitive SDS-max drive hammers and Hilti hammers using TE-Y and TE-FY shanks. Unrivaled power from solid carbide head with robust S-cutter design for added speed and life. Auto-Feed Attachment for Screw Guns The MA55 Screw Gun auto-feed attachment for Bosch SGH182, SG450 and SG250 drywall screwdrivers delivers added efficiency. It enables precise driving of rows of screws at top speed, while allowing comfortable continuous work, due to its ergonomic design and light weight. Its open design prevents dust from getting trapped in the mechanism and allows for a long product life. The MA55 can be used with widely-distributed strips of screws that have lengths of between 1 In. and 2-1/8 In. (25 mm and 55 mm), screw shank diameters up to 0.2 In. (5 mm), and screw head diameters up to 3/8 In. (9.5 mm). Auto-Feed Attachment for Screw Guns is rated 2.0 out of 5 by 3. Rated 4 out of 5 by Vizofoz69 from not bad I have used it for few weeks now. The major advantage is its weight, and ergonomics it is lighter and fits better in hand than competitors. Never jammed on me. Seems a bit fragile though, this must be a trade of of light weight. I hope it will last for me if I am gentle with it. Rated 1 out of 5 by Dgreen from Poor accessory support Good luck finding replacement bits that fit. No one sells bits that fit this thing.